A robot being developed at Carnegie Mellon University penetrates a model of a heart. Scientists and doctors are using the creeping metallic tools to perform surgery on hearts, prostates and other diseased organs. 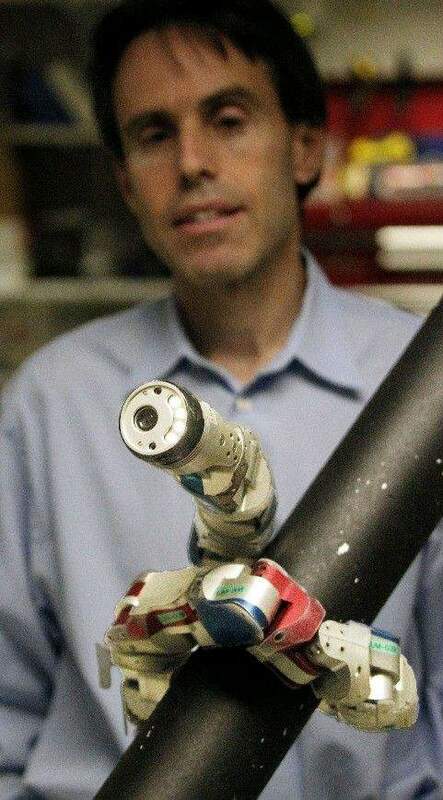 A robot demonstrates how it climbs up a tubular armature with the guidance of Carnegie Mellon University professor Howie Choset. Scientists and doctors are using the creeping metallic tools to perform surgery on hearts, prostates and other diseased organs. PITTSBURGH  Imagine a tiny snake robot crawling through your body, helping a surgeon identify diseases and perform operations. Its not science fiction. Scientists and doctors are using the creeping metallic tools to perform surgery on hearts, prostate cancer and other diseased organs. The snakebots carry tiny cameras, scissors and forceps, and even more advanced sensors are in the works. For now, theyre powered by tethers that humans control. But experts say the day is coming when some robots will roam the body on their own. It wont be very long before we have robots that are nanobots, meaning they will actually be inside the body without tethers, said Dr. Michael Argenziano, chief of adult cardiac surgery at New York-Presbyterian Hospital and Columbia University Medical Center in New York. Argenziano was involved with some of the first U.S. Food and Drug Administration clinical trials on robotic heart surgery more than 10 years ago. Now he says snake robots have become a commonly used tool that gives surgeons a whole new perspective. Its like the ability to have little hands inside the patients, as if the surgeon had been shrunken, and was working on the heart valve, he said. But Argenziano and experts in robotics say the new creations work best when theyre designed for very specific tasks. The robot is a tool. It is no different in that sense than a scalpel. Its really a master-slave device, he said. Howie Choset has been researching and building robots, particularly snake robots, at Pittsburghs Carnegie Mellon University for years. Choset believes that his snake robot and others like it help reduce medical costs by making complex surgeries faster and easier. Choset says his new design is smaller and more flexible than earlier models: The diameter of the head is less than the size of a dime. The size of surgical robots allows surgeons to operate with far less damage to the body, helping the patient heal faster. For example, instead of opening the entire chest during heart surgery, a small incision is made, and the robot crawls inside to the proper spot. Dr. Ashutosh Tewari of Weill Cornell Medical College in New York has used robotic tools to perform thousands of prostate operations. 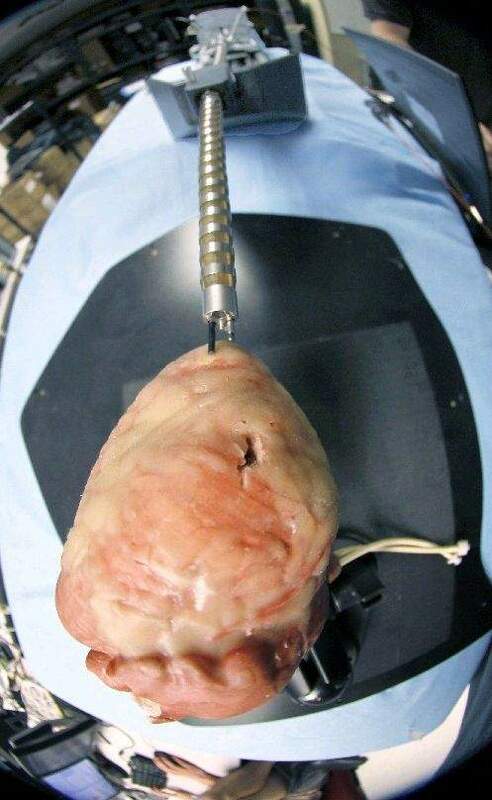 He said the precision of the tiny robotic tool is vital not just to cutting out cancerous tumors, but to seeing exactly what nerves to leave intact. Tewari said hes most excited about the potential for surgical robots to do things humans cant do. He said the variety of sensors available for surgical robots keeps expanding, even as they get smaller. He said they may one day be able to test chemicals or blood in the body, or even the electrical connections in nerves. Argenziano noted that robots arent a magic cure. The robot is good at certain things and its not good at other things, he said. Some studies have found that the cost effectiveness of surgical robots varies greatly. In smaller hospitals, the high cost of purchasing and maintaining a robot may not make sense. Choset has also built larger snake robots designed for search and rescue, or just exploration. They can climb poles or trees and then look around through a camera in the head, and slither through places humans cant reach. We sent our snake robots into these caves off the coast of the Red Sea to look for evidence of ancient Egyptian ships, he said. To me, archaeology is like search-and-rescue, but everyones been dead for 5,000 years, reducing the pressure. Another expert at Carnegie Mellon stresses that theres still an enormous gap between humans and even the most high-tech robots. Manuela Velosa noted that robots have been built that excel at one or two tasks  but not at the variety of tasks humans perform without even thinking. Velosa has been building robots that ask humans for help when they dont know what to do, as well as teams of robots that play soccer against each other. Sometimes, the robots surprise her. During one soccer game against robots from another university, the Carnegie Mellon team scored on a particular play. That sent a positive signal to the robots computers, which are designed to reward success and discourage failures in the game. Her robots then tried the play again  and scored again. It turned out they had discovered a programing flaw in the other team of robots, just like some sports teams find a flaw in their opponents. In the second half, Velosas robots kept using the same play, scoring every time and thus reinforcing the tendency to try the play over and over. The robots crushed the other team.